Ever wondered what PM2.5 actually means? We see this word flashing on the television screens especially during elevated air pollution in different cities of India but how many of us actually understand what it stands for? Many a times the same questions pop up in our brains- why is it important to study its levels? Where does it come from, is there a way to deal with it? What can we do at our personal level to stay healthy? In this blog, we will try to answer these questions for you and perhaps more! Gurjot Kaur is currently working as Post-Doctoral researcher at Human and Environmental Toxicology group, University of Konstanz, Germany. Her expertise lies in human risk assessment to natural toxins in the environment and she is passionate about increasing public awareness about human relevant issues and environmental preservation. Irfan Rahman is Professor at Department of Environmental Medicine, University of Rochester Medical Center, USA. He works extensively on understanding mechanisms affecting lung function and pathology in various respiratory diseases by external factors such as environmental smoke and air pollution. Air pollution is a major problem in many Indian metropolitans. In 2016, increase in Delhi smog became headlines during the time from Diwali to the end of winters. The levels of PM2.5 reached as high as 700 µg/cubic metre during the most affected days. Union Health Ministry, New Delhi advised people to stay indoors. Long hours outdoors caused skin irritation as well as asthma attacks in susceptible individuals including breathing problems in children. The whole episode highlighted the ever-increasing air pollution in Indian metropolitans such as Delhi. People were made aware that a steady rise in air-pollution is taking place. A look at the Air Quality Index (AQI) shows increase in air pollution also in smaller but steadily developing cities. In the absence of proper regulatory measures, the situation may worsen with passing years. It should be noted that the safety levels for PM2.5 are 60µg/ cubic metre and in cities with strict environmental regulations such as in Berlin, New York and Paris, the PM2.5 levels (average levels range between 20-60µg/cubic metre) can be controlled. The name itself, PM2.5, stands for fine particulate matter or droplets that are two and a half microns or less in width. On comparison to an ant, PM2.5 is approx. 1300 fold smaller in size. An average human is 150cm tall. It is invisible to the naked eye and due to this extremely small size, PM2.5 remains elevated for days in the air during periods of little or no wind/air mixing. Smog, burning of charcoal/coke/biomass/paddy fields/wood smoke, tobacco smoke, pollens, fungus, viruses as well as some bacteria come under PM2.5. 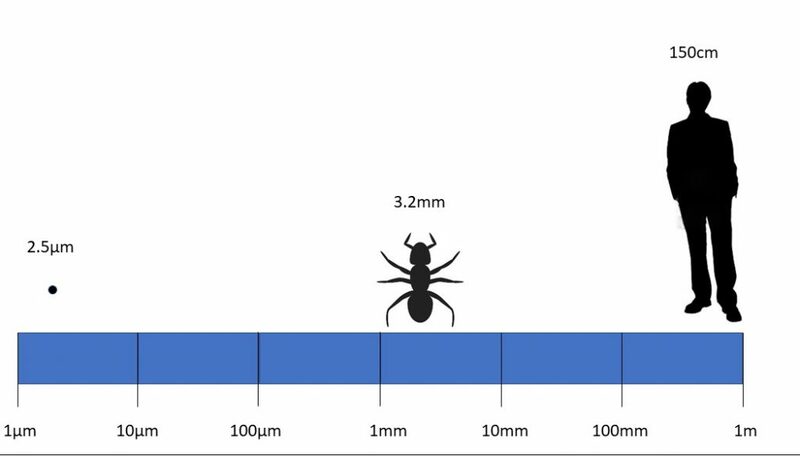 Figure 1 Relative size of PM2.5 to an ant and an average person. The particles are invisible to naked eye forming layer of so-called smog at very high concentrations. Sources of PM2.5 include automobile exhaust and other sources such as during combustion, construction, wood burning, oil or coal heating or even forest and grass fires. In many cities, the reaction of gases at power plants is also responsible for PM2.5 elevations. Due to wind, these fine particles are transported far from the site of production and may concentrate at regions of wind locking i.e. valleys situated at the end of air flow. Unfortunately, the traditional Indian cooking is also a source of PM2.5. Other indoor activities, such as tobacco smoke, candles, diesel and kerosene heaters also increase PM2.5 levels. In general, as the levels of PM2.5 in outdoor air increase, the air region appears hazy with reduced visibility. These conditions are similar in appearance to high humidity or fog but much more harmful because of the particulate matter content. 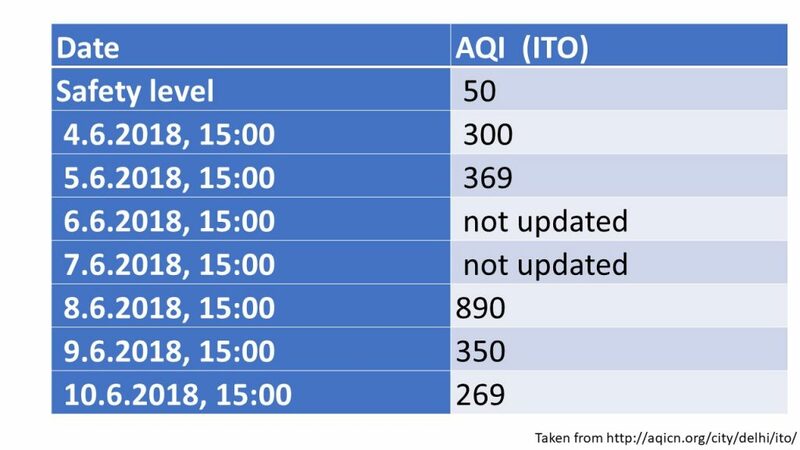 Table 1 PM2.5 levels during the month of May at ITO, Delhi using real-time PM2.5 monitoring station. The air quality index (AQI) as measured every day at a specific time for the week of 4.6.2018-10.6.2018. With the ever-rising levels of PM2.5 in Indian metropolitans, impact of PM2.5 on human health must be understood. Particulate matter enters the body through the nose and mouth during breathing. The bone and cartilage in the nose prohibit large matter even PM10 from entering into the lungs however the mouth has no filtering system. Larger particles such as PM10 are eliminated through coughing, sneezing and swallowing. This nose-filtering affectively stops any molecule larger than PM10 from entering into our systemic circulation. These include air pollutants such as some pollens, mold spores, some settling and cement dust particles. However, PM2.5 particles are able to invade deep into our respiratory tract into the lungs. Unfortunately, PM2.5 continue to the lungs due to small size and density. While many PM2.5 types get deposited in the lungs and cause local inflammation, soluble components enter systemic circulation leading to increase in systemic oxidative stress and inflammation. Downstream effects are hyperstimulation of immune cells. One of the hallmarks is stimulation of T helper cells as well as DNA damage in T helper cells. It is currently known that B and C vitamins could help decrease the ensuing DNA damage. This leads to increase in mediators of inflammation in circulation and imbalance in hormone levels resulting in serious health consequences for the lungs as well as brain and heart. 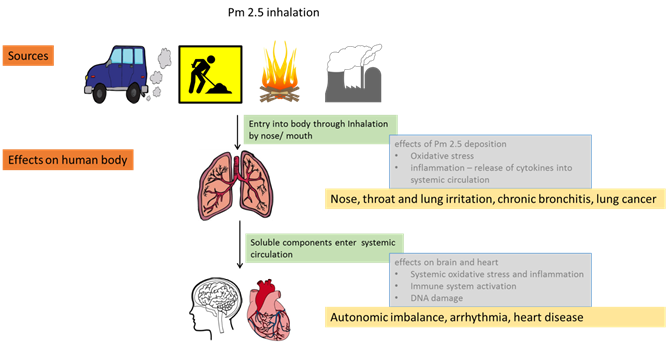 Figure 2 explaining health effects of PM2.5 on humans. Once PM2.5 enters the body through inhalation, it reaches heart and brain through a passage through lungs, affecting all these organs. Eye, nose, throat and lung irritation, coughing, sneezing, runny nose and shortness of breath are some common short term effects of PM2.5 exposure. Chronic exposure can cause worsening of lung function especially for patients with asthma (pulmonary) and heart (cardiovascular) diseases. Therefore, it is one of the reasons for increased respiratory and cardiovascular ailments in the recent times. Increased long term exposure to PM2.5 is known to increase risk of chronic bronchitis with reduced lung function and increased mortality from lung cancer, diabetes and heart disease. People with existing ailments are even more susceptible to worsening of disease. Children and old people are more susceptible to these effects and are therefore at risk of developing chronic health conditions. When outdoor levels of PM2.5 are elevated, going indoors may reduce exposure, although some outdoor particles may enter inside. Care should be taken to reduce PM2.5 levels indoors to ensure safety. Caution should be taken for walking and/or outdoor exercise. During periods of high fine particles, Outdoor strenuous (e.g. jogging and cycling) and some indoor activities (e.g. burning candles) should be limited. Dr. Gurjot Kaur, Human and Environmental Toxicology, Department of Biology, University of Konstanz, Konstanz, Germany. Dr. Irfan Rahman, Department of Environmental Medicine, University of Rochester Medical Center, Rochester, NY, USA.